Paul Hartley: What else can Falkirk do to stop Dean Shiels abuse? 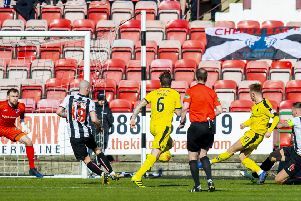 Paul Hartley has assured Kenny Shiels that Falkirk are doing everything they can to root out the fans who lobbed fake eyeballs at his son, Dean, during Dunfermline’s 2-0 win on Tuesday. Shiels Sr, who manages Irish side Derry City, was understandably furious after watching the abuse aimed at the Dunfermline midfielder during the Fife club’s victory at East End Park, suggesting that his son could be driven out of Scottish football by the vitriol and questioning the mindset of those responsible. However, he also criticised Falkirk, accusing them of ‘inaction’ and suggesting the situation should have been nipped in the bud when Kevin O’Hara and Joe McKee were found guilty of mocking Shiels’ disability in a fixture between the sides on 7 October. Falkirk released a statement on Tuesday, lambasting the ‘abhorrent’ and ‘disgraceful’ actions of a portion of their supporters and vowing to ‘take action against anyone identified’. “I think criticism of Falkirk’s handling of the situation is unfair,” said Hartley. “What does Kenny [Shiels] want the club to do? What else can we do? The club have made a statement, they are looking into it, and in no way have we underplayed this. Absolutely not. “We don’t want to see things like that happen. We know there’s a big rivalry but there’s a line that you don’t cross. “You can have a rivalry without that kind of thing and it’s not something we want to see happening in football. And the club are dealing with it as far as I’m concerned. Falkirk officials were last night awaiting CCTV footage from East End Park as they seek to identify and punish the perpetrators. Shiels had his right eye removed in an operation in 2006.